On February 8th the charitable concert for an Ukranian orphanage raised nearly $1000! Liturgy on Sunday 12/14/2014 will be served with His Eminence, the Most Reverend Kyrill, Archbishop of San Francisco and Western America. The Service begins at 10am. The English Liturgy at 8am will NOT be served that day. 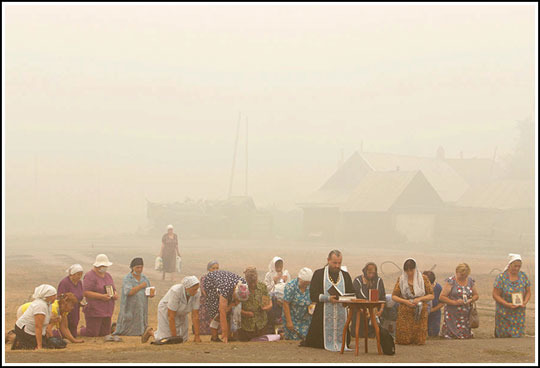 Western American Diocese collects donations for fire victims in Russia. You can send your donation before September 10th by a check straight to Western American Diocese (the address is below) or by a debit/credit card on our donation page. In any case please do not forget to note that your donation is for Fire Vitims in Russia. at 6 pm, 7pm, 8pm, 10 pm and after the Easter Matins. This year, the Holy Unction (Soborovanie) will be held at the Holy Transfiguration Cathedral on March 23rd at 6 PM. Please schedule your confessions prior to that day. It is customary for Orthodox Christians to bless their dwellings each year with the newly sanctified water of the Holy Theophany (after January 19th). To schedule a visit, please contact Fr. Martin (Orange county and Southern L.A.) or Fr. Alexey (L.A. and the Valley) or leave your contact information at the candle stand at the church entrance. Please indicate what time is convenient for you.